Men Honeymoon Outfits – Honeymoon is the perfect time to relax with your loved one and get to know them better. This is going to be one memorable trip of your life that neither of you is ever going to forget. From the destinations you visit to every little conversation you have, everything is extremely special. And that is exactly why you can not afford to mess it up in any way. Deciding which outfits to pack for your honeymoon is as important as deciding your wedding day outfit. Naturally, you would want to look your best to impress your significant other.There is a major difference between when you are traveling with your friends and when you are doing so with your loved one especially shortly after the wedding. Unlike other times when you are hanging out with your boys, you can’t just wear anything or repeat the same outfits. Your style game needs to be on point this time. To give you a better idea about the kind of outfits you will be needing, we have prepared a list of 20 best honeymoon outfits for you to benefit from. Have a look! Summer outfits and destinations are all about palm trees and pineapples so why not go for such a print? They look absolutely cool. 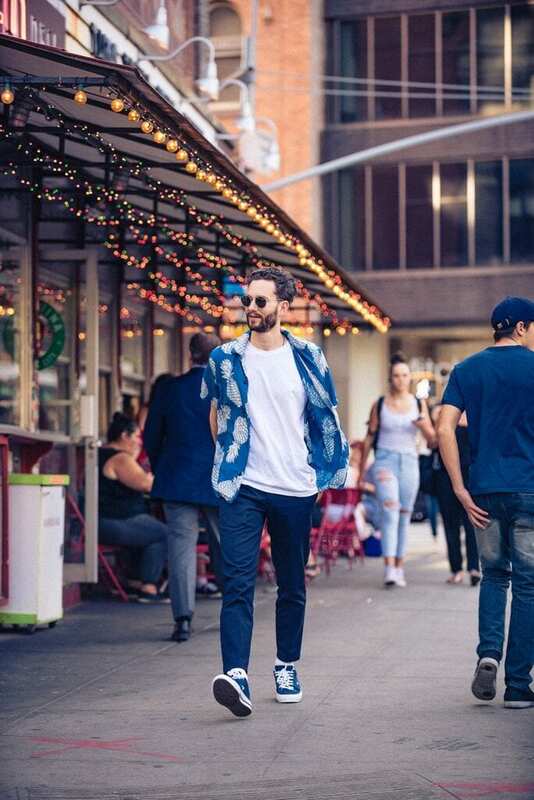 Here are 15 Best Summer Travelling Outfit Ideas for Men. Polos are definitely the most comfortable pieces of clothing ever. There are hardly any places where it would be inappropriate to wear a polo. If you are traveling in spring then this kind of floral shirts are perfect for you! Check out these 25 Ways to Wear Guys Floral Shirts for Men. Tropical destinations are great for relaxing and for that you need an outfit that lets you relax! Go for tank tops or half sleeved shirts with shorts if you are on an island. And don’t forget your summer accessories! Your honeymoon is not complete until you have visited the beach with your loved one. If you want to keep it casual and not look ordinary at the same time then you can go for a checkered shirt and shorts with your favorite cap. Here’s a complete guide on What Men Should Wear at Beach? Denim jackets look great, both buttoned and unbuttoned and give a very fashionable look. They can be worn almost all year round so do not worry about the weather! Having at least one clothing item in the color black is a must. We prefer a black colored jacket as you can wear it over almost anything and anywhere. If you like wearing black, here are 18 Ways to Wear Black Jeans for Guys. If you are going to a formal restaurant on a date with your special someone, you should go for this all black suit look. We guarantee you that you will have all eyes on you. Boys, do not forget to step out without making sure that you have kept a basic tee with you! The number of ways in which you can style it is uncountable. A few examples may be to wear it under a jacket, under a flannel shirt or simply on its own. For footwear, you need to have a pair of sneakers. They are super comfortable for long walks and look stylish at the same time. Here are 18 Ways to Wear Sneakers Fashionably. If you are going out on a day of exploring and touring the city, you may want to dress smartly in perhaps a blazer. After all, you should look dashing in all the pictures you will be taking at all the famous tourist spots. You should also see these 27 Ways for Men to Wear Shoes without Socks. No winter vacation is complete if you have not worn one of these super cool jackets at least once! Here are the best Leather Jacket Outfits for Men. Ripped or boyfriend jeans look amazing and can be worn both casually and semi-formally. Do check out 18 Tips How To Wear Ripped Jeans. Scarves add the finishing touch to your look so make sure to keep one if you are traveling in winters. You can also wear your scarves with sweatpants for a warm and casual look, so here are 20 Cool Ideas on How to Wear Sweatpants. Essential accessories include sunglasses, caps and hats. You can not possibly leave these accessories at home! We hope this article took all your confusions and worries away. Remember that at the end of the day it is all about relaxing and having the time of your life, so don’t stress out about your outfits too much. All you need to do to look good is to be confident and carry yourself the right way, and the compliments will flow in themselves!